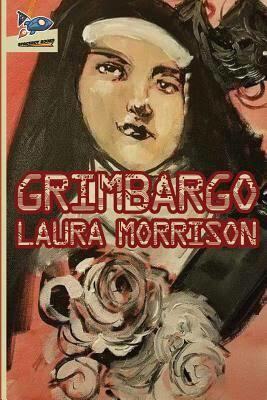 Laura Morrison’s Grimbargo begins when journalist Jackie Savage and Docent Jamie Nguyen are drawn into an investigation of a death—the first human death in ten years. It quickly advances to a (possibly ill-advised) attempt to save all human life. It’s possible that humanity doesn’t deserve to be saved—and even more likely that the chosen heroes aren’t up to the job. In Morrison’s strange dystopia, humanity is essentially held in stasis, unable to age, grow, or die. No matter how catastrophic the injury, nanobots return them to the physical and cognitive condition they were in when the world-altering “greywash” hit. This gives a fresh and interesting solution to the problem of overpopulation in an immortal society: even those who were heavily pregnant before the greywash can never give birth. The premise of the greywash, with all its positives and negatives, feeds the action and drama of the novel, while Laura spins her tale around the conspiracy of its origins. …humanity had put itself on an inevitable trajectory toward destruction … since humanity was the problem, it clearly followed that the solution was either eliminating humanity or rebooting it. We chose the latter, because we are not evil. Not at all. Grimbargo moves at a fast pace throughout, driving towards a neat conclusion that leaves room for a sequel. There is little time to slow or stop; the novel takes place over a period of days rather than weeks, without breaks for food or sleep (unless loss of consciousness counts). The author takes advantage of her premise of immortality, so the action plays out with plenty of splatter and gore. The dialogue drips with jabbing humour: sometimes perfectly timed, but frequently over-the-top. At its best, it is witty and provides a counterpoint to the furious pace of the action. At other points, the protagonist’s attempts to deliberately prod and annoy the people around her have the potential to profoundly annoy readers as well. Some running jokes outstay their welcome. The protagonists are always one step behind as they try to sort enemies from allies. Character growth is not a strong point: despite the close POV, the novel focuses more on dialogue and external events than introspection. Some of the secondary characters captured me more than the main characters; a certain grandmother encountered in the story was notably more sympathetic. Others fell flat, and came across as self-contradictory or one-dimensional. An example would be Stewie, who is memorable as a frequent object of gibes and physical humour, but is never played out as a full character. I was drawn to this book partly because of its setting, as Kyoto is one of the few overseas cities I’ve visited. However, I was disappointed to find that the focus on action prevented much description of Kyoto as a city. With the exception of the monkey-park, it could have been set in almost any city in the world—a pity, as Kyoto is a rich place to explore. The fact that neither of the protagonists elects to eat or drink may have contributed to this problem: two of the five senses (smell and taste) were unexplored. Purple prose wouldn’t have suited this novel, but a few more sensory details might have given it a lift. Grimbargo will not suit those looking for a deep literary or sensory experience, and is unlikely to appeal to fans of “hard” science fiction. It touches on nanotechnology and plague bombs, but doesn’t delve deeply into the mechanics of it all, preferring to keep things light. Those seeking a SF thriller containing some thought, more action, an explosion here and there, and liberal dollops of “snark” throughout will find their match in this book.